A perennial bestseller, this sourcebook offers a comprehensive reference for scholars and students of Asia. The second edition reflects the interactions of ideas, institutions and historical events up to the present day. Wm. Theodore de Bary is John Mitchell Mason Professor Emeritus and Provost Emeritus at Columbia University, and Director of the Heyman Center for the Humanities. 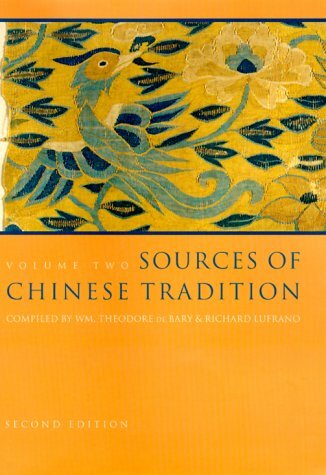 He has written extensively on Confucianism in East Asia, and is coeditor of the first edition of Sources of Chinese Tradition,as well as Sources of Japanese Traditionand Sources of Korean Tradition.Richard Lufrano is assistant professor of Chinese history at the College of Staten Island and the author of Honorable Merchants: Commerce and Self-Cultivation in Late Imperial China.